Historically, diesel cars have been more efficient than petrol ones. They simply burn fuel in a more efficient manner, which means less used per kilometre. So, you get about 30 or 40 per cent more cruising range out of a diesel. If you’re going 700 kilometres on a tank of petrol, you’ll be going more than 1000 on a tank of diesel. That said, with the introduction of higher-tech turbocharging systems the petrol world is catching up. In general, you’ll find petrol more efficient than diesel over a medium-to-long term of ownership if you predominantly do shorter trips. If you travel more on the motorway for longer distances, diesel is the way forward. Petrol engines deliver more power – by spinning faster, but diesels deliver huge torque at low revs. And that means they produce more low-rpm power – maybe three or four times as much low-end grunt. So they just seem to storm ahead at 2000rpm – without very much fuss. And at those low revs, petrols just can’t keep up. So, if your objective is to set the lap record somewhere you’d generally want to be in the petrol – and then you need to rev it really hard to exploit the extra power. But if you just want to cruise effortlessly uphill at 2000rpm on the freeway – possibly with a moderately heavy trailer behind, you’d go for the diesel every day. Traditionalists may argue that petrol cars are better to drive than diesels. The main reason for this is that diesel cars have a much smaller power band, so you generally get more torque but spread over a smaller rev band. This problem is amplified by turbocharging, which is employed on most diesel engines these days to improve efficiency. The upshot is that you often have to wait for the turbocharger to ‘wake up’ before the car’s performance is unleashed. After the surge, it’s time to change gear again as the torque tapers off. In a typical petrol car power builds in relation to the revs, meaning more usable performance more of the time. It’s extremely satisfying chasing the needle to the red line on a petrol car, but others may prefer the lazier, lower-rev driving style of a torquey diesel. Petrol engines are generally smoother than diesels, though premium manufacturers such as Jaguar and Audi are now building larger-capacity diesels which are almost silky smooth. Scenario: Here’s a common scenario: you’re driving along at 2000rpm. You get to a hill. It’s a steep one. So, you need more torque to climb to the top. In the petrol, the torque is bugger-all at 2000rpm, even when you mash the throttle wide open. So the transmission has to throw back one or even two gears, just to get the engine revs spooling up to the optimal delivery point for enough torque at that road speed. There’s a lot of rotational intertia shunting around in the engine and gearbox in those operating conditions, and that feels undignified. In the diesel, though, you just hit the accelerator. The torque ramps up automatically to the maximum available – because you’re already at the right revs. The car climbs the hill effortlessly. At least that’s how it seems, in comparison. That’s the other thing about diesels: there’s no throttle. Sure – there’s an accelerator pedal, but they’re connected to different things in petrols and diesels. Petrols have a throttle – that’s the butterfly gizmo in the inlet air plumbing that controls air going in. That’s how you vary the engine output in response to load. Diesels have no throttle – they run wide open the whole time, for air. The accelerator in a diesel is connected to the fuel delivery instead. The biggest difference between a diesel and petrol internal combustion engine, aside from the types of fuel they use, is how they ignite the fuel. A petrol engine uses a spark plug to ignite fuel inside the cylinder. A diesel engine uses a much higher compression ratio within the cylinder to heat the air inside. When the fuel is injected into the compressed air, it ignites without a spark plug. Because the air is so compressed, the engine gets greater efficiency from the fuel. This means a diesel engine is generally 20 per cent more efficient than an equivalent petrol engine. 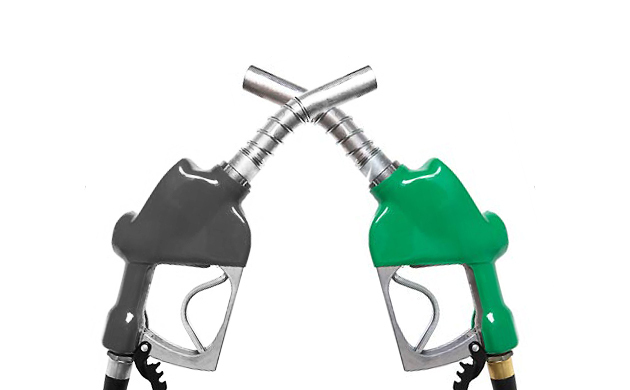 Diesel produces more CO2 emissions per litre of fuel burnt; about 17 per cent more than petrol. But because it uses less fuel, it actually produces less CO2 in total. Diesels also produce more noxious gases, including nitrogen oxide and sulphur oxide as well as diesel particulate matter, otherwise known as black soot. Most diesel vehicles have a filter that captures the soot and burns it off. Another downside of diesel engines is that they are strengthened to cope with the extra forces needed to compress the air and ignite the fuel and so are generally heavier than petrol engines.